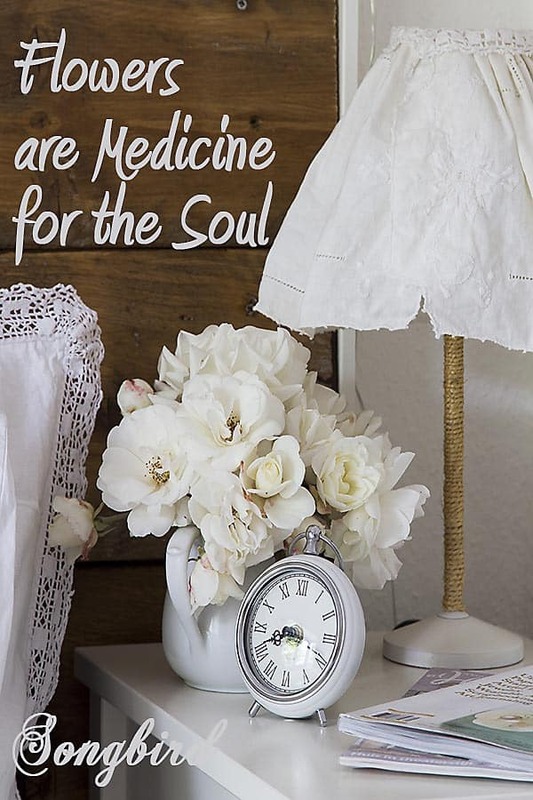 Showing you the healing powers of flowers….. Turns out I was a bit optimistic in my last post. I wrote it Monday morning, and was feeling fine. Then everything turned haywire really fast and by Thursday evening I was sicker than I was before. So this time I really took my time in getting back on my feet. And I feel I can now say with true confidence that I am almost my old self again. I feel I have somewhere lost the month of May in a vortex of fever, sniffles, and coughs. A whole month spent sleeping, lounging, reading, drinking copious amounts of hot tea, feeling down and miserable and waiting for things to get better. You bet’ye I am ready for June! I spent the weekend going through the house and removing every bit of evidence of sickness and replacing it with things that made me smile. No major Spring cleaning here just tidying, decluttering and beautifying. 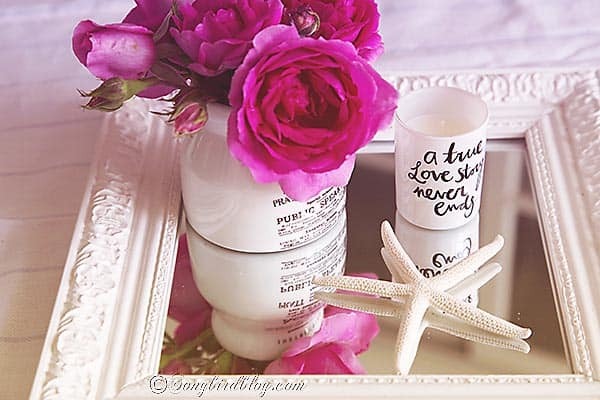 I collected all the stray tissues, neglected teacups and scattered magazines and replaced them with flowers everywhere. My garden, also terribly neglected and majorly ignored, is producing abundant flowers. I couldn’t enjoy them in May so I made up for that by bringing in lots of flowers. Even my bathroom is sporting a floating rose midst a sea of candles. Now that has healing powers all by itself. A hot soaking bath, some scented candles and a fluffy new towel. Medicine for body and soul. I was just in time to catch the final moments of my peonies. Oh yeah, so pretty and fragrant. I LOVE peonies! Yep, I don’t intend to spent too much time in my bedroom this month, did enough of that already. But having some fresh roses on my nightstand sure makes me happy to wake up there in the morning. Yes I can feel it, summer is almost here and I am ready again to enjoy it to the hilt. Wlcome back! I’m glad you’re feeling better. Your flowers are lovely–glad you didn’t miss out on those peonies! Thanks and me too! The blooming of the peonies always feels like a milestone in my garden. They are so vibrant and fragrant and yet the bounty is so short lived. Feels like I should take up residence beside them while they are still there. Me too! I was so sick of being sick. Thanks for waiting for me to return. You never cease to amaze me how refreshing your design is to my eyes. I’m loud and bold in my colors and I visit your little primping of your things and I feel calm. I am so glad you finally feel better. I think that was my December for me. Blurrr. I’m glad you have the photo of the peony for they are so beautiful!! They do not grow in my zone but do a bit north of here where I’d visit and enjoy. Know you’re thought about and take it easy even now!! LOL, I actually thought I was being a bit loud and over the top with my flowers in every corner of my home. But yes they sure did help make me feel better and feel like creating and decorating again. Thank you so much for all your well wishes, they sure did help. Take care! Gorgeous flowers and beautiful pics! Thank you! You have some beautiful peonies on your blog too. Aren’t they just the most wonderful flowers!